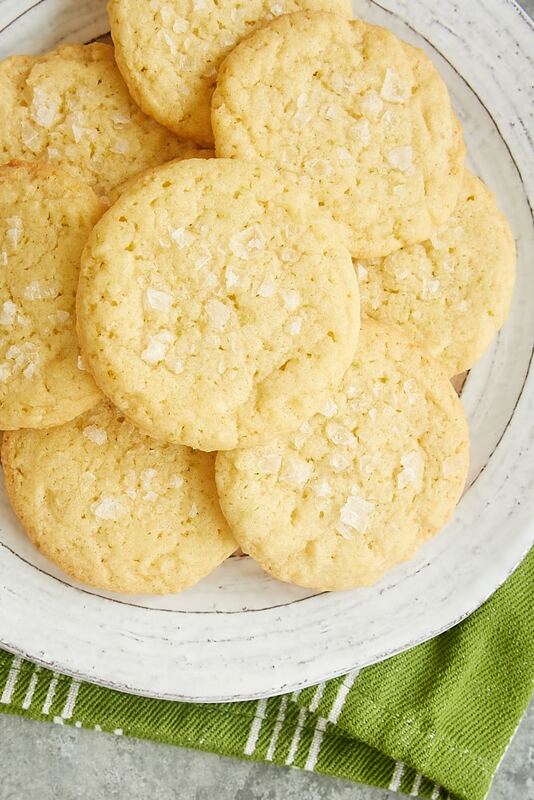 Take a simple lime cookie, add a sprinkle of salt, and you’ve got these fantastic Sea Salt Lime Cookies. 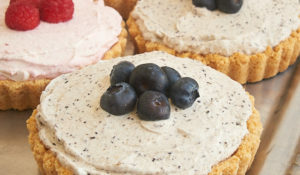 A sweet and salty dessert dream! 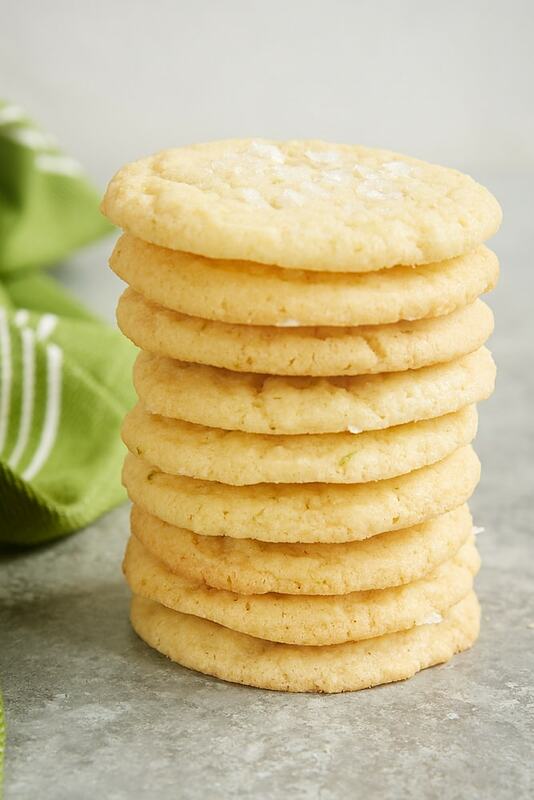 These Sea Salt Lime Cookies are simple, buttery cookies with lots of lime juice and zest for a lovely citrus taste. If you love citrus flavors, then these will be right up your alley. But top them off with a little sea salt, and you’ve got something extra special. It’s like a margarita in cookie form minus the tequila! I have to say that when I first made these cookies, I expected to like them a lot. What I didn’t anticipate was how very much I would adore them. I’m so enamored with this particular combination of sweet and salty that I just can’t get enough of them! Most cookie doughs will benefit from a little chilling time. However, I find that this cookie dough works better if it’s not chilled. It’s easier to handle and portion at room temperature without resulting in much difference in how much they spread. 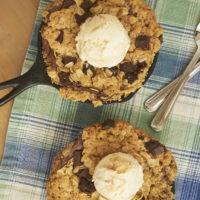 When you’re ready to portion the dough and place on the baking pan, I recommend using a scoop to portion the dough and then flatten the cookies. They will spread as they bake, so be sure to leave plenty of room between them on the pans. 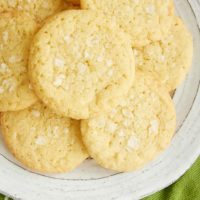 All it takes is just a little sprinkle of sea salt on these cookies to give them that wonderful salty bite. Any coarse salt will do, but I like to use a large flake sea salt like Maldon for these cookies. If you like crispy cookies, add a couple of minutes to the baking time. I’ve baked them both soft and crispy, and my preference is soft or maybe about halfway to crispy. That gives you that little bit of crispy outside yet still soft on the inside. But crispy is really good, too, and that’s coming from someone who doesn’t really like crispy cookies. 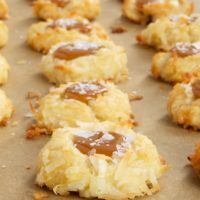 If you’re a sweet and salty fan, then I urge you to bake a batch of these fabulous Sea Salt Lime Cookies. I hope you’ll find the sweet, tart lime plus a little salt to be as irresistible as I do! 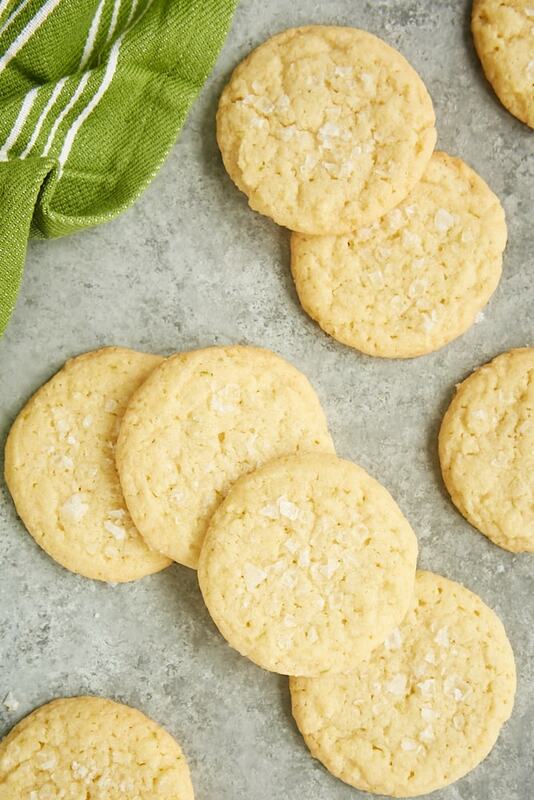 Take a simple lime cookie, add a sprinkle of salt, and you’ve got these fantastic Sea Salt Lime Cookies! Whisk together the flour, lime zest, baking soda, and salt. Set aside. Using an electric mixer on medium speed, beat the butter and sugar until light and fluffy. Mix in the egg yolk and lime juice. 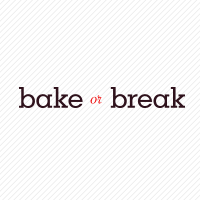 Drop the dough by tablespoonfuls onto the prepared pans, leaving about 3 inches between cookies. 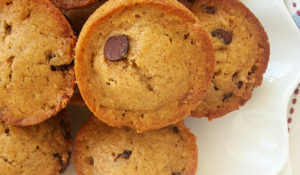 Flatten each cookie to about 1/2-inch thick. Sprinkle the top of each cookie with a pinch of sea salt. 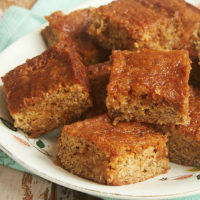 Bake, one pan at a time, 12 to 14 minutes, or until the edges of the cookies are lightly browned and the tops appear set. These cookies look like they have such an amazing texture! 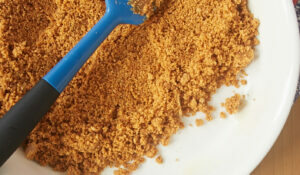 I also love the combination of lime and sea salt – sounds divine and addictive! 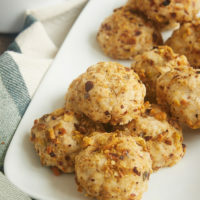 I just scoured my pantry/fridge to make sure I could make these. 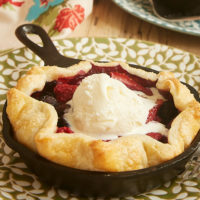 Going to make them tonight! Thanks for sharing – salt and lime is a must in our home!